Now you can have secure, real-time access to plant floor data — from any Internet connection, anywhere in the world. Accessing CT webHMI web pages is simple and secure using standard internet browser software. CTC’s patented web server technology enables you to access plant data from virtually any existing computer without additional material costs or system setup. Call up a graphical, online, real-time display of your process just as easily as you would access your bank account or weather forecast. Because web page access uses familiar browser technology to display data, training costs are also minimized. In addition to remote viewing, CTC's web server technology provides secure remote control capabilities as well. This fully bi-directional interface lets remote users adjust switches and dials, enter data, change recipe settings, and fully interact with the CT webHMI project from the remote browser interface. CTC's embedded security features provide the ability to assign different levels of security so that only those users with the proper clearance can "see" or interact with a given object. 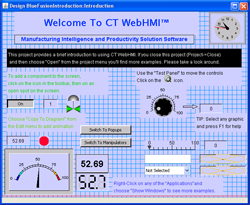 Exporting a CT HMI project to a Model 5300 Web Server is accomplished via a menu selection. The CT webHMI project can then be called up on one or more remote devices by simply typing the controller’s address/project name into the browser’s address bar.